You may not notice art and spa as long wedded partners, but cast you mind to your favourite spa. We’re certain there will have been calming, soothing, even uplifting artworks on the wall. Some spas are a piece of artwork themselves, The Royal Mansour in Marrakesh was created by a team of over 1,500 Moroccan artisans. 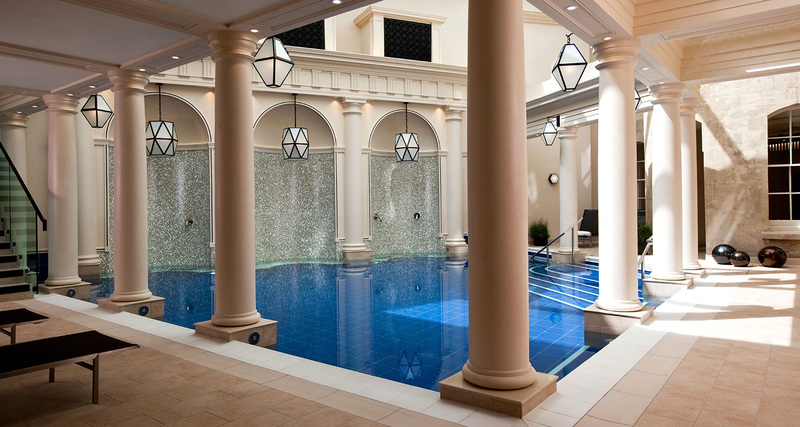 A relative new comer to the UK spa scene, The Gainsborough Bath Spa is steeped in art. Named after the artist Sir Thomas Gainsborough, the hotel brings together a blissful synergy of Baths wellness history and the endless luxury of a five star hotel. Gainsborough lived in Bath in the 1760 and artworks line the walls of the grand Victorian hotel. The reception is all marble floors, fresh white walls, blue and grey flourishes and ornate flower displays. Our fourth floor suite had views over Bath and the neighbouring Thermae Spa. Décor is very Farrow and Ball with crisp white shutters on the windows. All of the spa suites have unlimited access to the spa and Bath’s thermal waters on tap in the bathroom. We donned our robes and cotton slippers and headed down to the spa. Decorated in soft white tones and dark wood, the minimalist design aids a clear mind. Our spa assistant, Nick, mixed a healthy, probiotic cocktail while we filled in our consultation cards. He also created a small mesh inhalation bag for us to carry around during our time in the spa – mine was full of sea salt, rosemary, orange and eucalyptus. A beautifully personal touch. The Gainsborough is the only hotel spa with access to Bath’s thermal waters, and it’s used in the pools and treatments. A second spa assistant, Michel, explained the order in which we should experience the bathhouse. First the warm thermal pool, next the hotter pool, followed by the infra-red sauna, traditional sauna, steam room and blissful main thermal pool with swan neck pipes and leg jets. A few moments into our soak, Michel offered us a lavender-infused cold cloth and fruit-infused water. Our treatment journey started in the thermal pools. My therapist, Kabir, asked me questions about my confidence in water, levels of emotional and physical stress and explained the Freedom Water Treatment (45 minutes, £150). We entered the water and I took a seat on the bubble lounger and fastened on a nose clip (not glamorous, but necessary). Kabir lifted me over his shoulder and asked me to close my eyes and focus on breathing deeply and slowly. His hands moved over my legs and back, pushing and stretching my body through the water in time with my breath. The treatment requires trust, and after a few minutes I relaxed into it. Kabir softly said that he would be taking the movements under the water. After I breathed in Kabir lowered me into the water and moved round at a 90 degree angle to bring me up as I needed to breathe out. The treatment is the nearest I have ever got to a completely clear mind. I felt light-headed, and had lost all concept of time. My next treatment was the Malay Massage (90 minutes, from £180), also with Kabir. We started in the water ritual room; I took a seat on a simple wooden bench in the centre of the room and Kabir gave me a glass of water explaining that the symbolism of the room was to take a moment to centre your thoughts. He handed me a wooden book – two pieces of wood bound together with twine and inside set honey wax – and a mental ‘pen’ and said to inscribe a wish. He washed my hands in the thermal water coming out of the fountain in the room. We walked through a corridor to reach our treatment room. The bed was laden with fluffy dark blue towels; I made myself comfortable lying face down. Kabir asked me to breathe in the scent of Neal’s Yard Geranium and Orange Oil which he used for the massage. Kabir used deep palm kneading movements to massage my back and legs, working in meridian lines up my body. He stretched my arms and shoulders and used deep pressures to release tension. I turned over and he used similar long flowing massage strokes on the front of my body, focusing on my hands and arms. At the end of the treatment Kabir walked me to the relaxation area and brought me a berry and hibiscus tea with chocolate macaron. The treatment was beyond intuitive, I was in a state of relaxation far deeper than spa normally brings. Kabir has a life time of experience in his hands and this was one of the best treatments I’ve had. The Gainsborough Spa also offers Kerstin Florian body treatments, Ama La facials and a multitude of massages. You’ll need to be a member or staying in the hotel to use the spa; every treatment comes with a two hour experience in the thermal waters. Tear yourself away from the spa and head to the bar and restaurant – the food and drinks are as good as the treatments. Pie, the enthusiastic barman, will whip up sumptuous spa-inspired cocktails, beautifully presented in a glass teapot and tea mug. For dinner, try the chef’s taster menu we started with a goat’s cheese, radish and tomato pot followed by smoked salmon and seared scallop, mushroom risotto, the chef’s signature duck dish and chocolate brownie with banana ice cream. The food was a delectable finish to our exceptional spa day. The Gainsborough Bath Spa is one to savour, remember and re-live.